It works. I had two days to prepare. Day one washed hair with detox five times back to back. Day two washed four times back to back. Each time I massaged scalp and hair for ten minutes and then let it sit for another three minutes. Day of test washed once more with detox and then followed with Zydot. Again massaged for ten minutes and let it sit for three. Clean as a whistle!! Note I do not smoke pot but have used cocaine at least six times in larger amounts in two months. Thanks for sharing your successful hair cleansing story. Other users will defiantly benefit from it. Hi. Needing a little direction on what steps I need to take. I’m a moderate to heavy marijuana user. I typically smoke 2-3 bowls per night, then more on the weekend. About 7 grams every 2 weeks of high grade. I am currently in the interview process for a new job (1 of 4 interviews in process). So I am not sure when the test will be but I am assuming in the next 3-4 wks. I just quit smoking today when I found out it was a hair test vs blood/urine. What would you recommend given my timeline and usage? Thanks for the advice. Michael..In your case, I would classify you as an extreme heavy user. As you stopped smoking only a couple days ago, a significant amount of THC is still deeply stored in every fat cell of your body which can be detected in urine from 45 up to 90 days. As a result, hair can be re-contaminated by THC-COOH through sweat glands and the bloodstream again. In order to avoid hair recontamination, any hair cleansing methods should be done as close as possible to the actual drug test day. So far, we have seen that the best results users have are when they combine two methods: The Macujo and Aloe Toxin Rid Treatment methods. They start cleansing their hair with aloe shampoo for some time and then use the Macujo method 3 days prior to their hair drug test with the Ultra Clean shampoo used on the day of the test. Please remember that you should complete the Macujo method as close as possible to your actual hair drug test in order to avoid recontamination by THC-COOH. According to the instructions, it should be performed at least 5 times in 3 days as close as possible to your hair drug test. If your hair can handle it, more is better during these 3 days. Chris.. The Macujo method should work for all body hair including the legs. I received a positive result and my THC rating was .31 picograms. Is this a lot to show up on a hair screen? Ben..Usually the confirmation cut-off level is 0.10 pg/mg. Your THC level is 0.31 pg/mg. This shows you tested positive. Usually the numbers of the hair drug test results for marijuana do not reflect what kind of smoker you are. It works differently for other prohibited substances though. Depending on the drug levels found in a hair sample, you can be identified as a low, moderate or heavy user. I used to smoke almost daily for 6 months or every other day from January 2016 . I stopped smoking at the end of June 2016 because of a future hair follicle test . Im 5’9 and weigh about 170 or 180 pounds . During july since it was very hot at work i would constantly sweat alotand drink water at least 4 to 5 bottles a day and occasionally drink green tea . All of july i was clean. In august 2016 i smoked twice . Then September 2016 i smoked once . Now i have the test coming soon and i have the aloe shampoo with the ultra clean. What kind of user am i?? And also without me knowing the exact day of the test is 3 or 4 days enough time to wash out all the thc so i can pass ?? Rabbit..Based on your smoking history, even though you stopped smoking marijuana in June and did not smoke much during last 3 months, I would classify you as an extreme heavy user as you smoked marijuana daily before July. As result of daily usage, significant amounts of THC are stored in your body fat cells. This means that during June, July and September, your hair was constantly recontaminated and most likely most of your 1.5 inches of hair closest to the scalp are contaminated at this time. In order to increase your chances of passing your hair drug test, you need to perform the proper hair cleansing methods. So far, we have seen that for the best results users have combined the two methods: The Macujo and Aloe Toxin Rid Treatment methods. They start cleansing their hair with Aloe shampoo for some time and then use the Macujo method 3 days prior to their hair drug test with Ultra Clean shampoo used on the day of the test. As you do not know when you have the hair drug test, you can start using the Aloe shampoo now. However, you need to make sure to leave enough shampoo to perform the Macujo method 3-4 days before your drug test. Hope this helps. Keep us updated. Christy..I hope that you were able to postpone your hair drug test as one day is just not enough time to cleanse your hair properly. It is pretty tough to perform many Macujo method procedures in such a short period of time as well as many hair washes with aloe shampoo and not to mention the damage that you will cause to your hair. To increase your odds of passing your hair drug test, you need to have at least 2-3 days in order to perform enough hair cleansing procedures to be effective. I have two boxes of the Ultra clean and one bottle of the old aloe shampoo, if I use the aloe toxin rid treatment method a week before my test, and then and If I use the aloe shampoo when I shower and shampoo myself with it, & and then on the day of the test I do the aloe treatment method again with this increase my odds of passing my hair follicle test ? David.. Without knowing your smoking history during last 4 months, it is tough to say if your approach will increase enough your odds of passing the hair drug test. So far, we have seen that the best results users have achieved are when they combine the two methods: The Macujo and Aloe Toxin Rid Treatment methods. They start cleansing their hair with old aloe shampoo for some time and then use the Macujo method as many times as their hair can handle it 3 days prior to their hair drug test with the Ultra Clean shampoo used on the day of the drug test. I always recommend after completing hair cleansing methods checking the hair sample with an express home hair drug test. This can show you if you can pass your hair test or not. I’ve used coke 3 times in three months all light use. 2-4 lines. I used aloe shampoo in combination with Macujo method. Do you think I will be good? Jimmy..If you followed the hair cleansing methods’ instructions and our recommendations to the letter, you should have a good chance of passing the hair drug test. For future reference, if you would like to check where you stand after completing the hair cleansing methods, I always recommend using an express home hair drug test. This will show you if you can pass your actual hair drug test or not. Good luck with your test results and keep me updated. I’m a heavy smoker and I been smoking a long time and now this job have came up and I’m getting a hair drug test…Will This work for me if I receive product Wednesday? My test is Friday morning and my hair length is about 41/2″? Talya..As you do not have much time until your hair drug test, I would recommend performing the Macujo hair cleansing method as soon as you receive Detox and Ultra Clean shampoos. The Ultra Clean shampoo should be used on the day of the hair drug test. According to the instructions, it should be performed at least 5 times in 3 days as close as possible to your hair drug test. If your hair can handle it, more is better during these 3 days. We have seen that some heavy users performed 8-10 Macujo methods in order to increase their odds of passing their hair drug tests. If you experience a dry or red scalp, we have seen that some users have had success using a hair conditioning product to ease the discomfort. However, please make sure you wait at least an hour before applying any hair conditioner. If at all possible in order to get all the treatments in, could you delay your hair drug test a day or two? This would be increasing your odds of getting your hair THC-COOH levels below the cutoff levels and would be a little easier on your hair. I still think that you can get it done but it will be intense. Good luck with your test and let me know how you did. Will it be ok if I washed my hats and wear them? I have smoked in them before? I went and bought new comb for after I’m done washing my hair so I can comb to blow dry…is that ok? Talya..It is ok to use your hats after you washed them properly. You can use a new comb when you blow dry your hair as well. I am glad that you are following our recommendations of washing your hats and using new combs in order to avoid recontamination. Will it be ok if I wait an hour and put conditioner in my hair then use this foam to lay it down? Talya..It should be ok to wait an hour and then use the conditioner and other hair products. I haven’t washed my hair since Sat..washing it tonight tho…haven’t gotten rescheduled for the interview yet…will that affect me trying to pass the hair drug test? I haven’t been smoking at all!! tonight will make 7 times that I have washed my hair. Talya..If you would like to increase your chances of passing the hair drug test, you need to follow the hair cleansing instructions and our recommendations to the letter. Usually companies ask labs to check your last 3 months history. Since hair grows half an inch a month, labs tests only the first 1.5 inches of the hair closest to the scalp. So, in order to grow clean hair, you need at least 3 months and for many heavy users around 4-6 months because of hair recontamination. As I mentioned in my previous reply, I would recommend performing the Macujo hair cleansing method as soon as you receive Aloe and Ultra Clean shampoo. The Ultra Clean shampoo should be used on the day of the hair drug test. As you are a heavy user, washing hair with aloe shampoo only 7 times will not be enough to drop THC-COOH levels in your hair below the cutoff levels. On top of washing your hair with aloe shampoo, you should perform the Macujo method following the instructions precisely at least 5 times in 3 days as close as possible to your hair drug test. If your hair can handle it, more is better during these 3 days. We have seen that some heavy users performed 8-10 Macujo methods in order to increase their odds of passing their hair drug tests. If you want to achieve your goal of passing the hair drug test you need to take your hair cleansing process seriously. Otherwise, you will face a negative outcome. Hair drug tests are the toughest one to pass. Hope this clarifies your questions and keep me updated. Talya..In your case, I would recommend performing the Macujo method as many times as your hair and scalp can handle it as the THC-COOH levels in your hair are very high. If you follow all hair cleansing methods instructions and our recommendations, your chances of passing the hair drug test will be pretty good. If you wash your hair with the Aloe shampoo and perform only several Macujo methods, you won’t be able to pass the hair drug test. 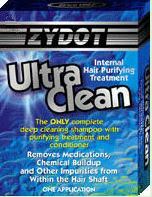 Do not forget to use the Ultra Clean shampoo on the day of your hair drug test tomorrow. We are all pulling for you. Good luck with your test tomorrow and let me know how you did. I’m confused now…I suppose to wash my hair with shampoo and do method so I will pass my test now you telling me different….I have washed and performed method at least 10 to 11 times and you mean to tell me I want pass my test?? Talya..If you followed all methods instructions and our recommendations to the letter, your chances of passing the hair drug test will be pretty high. However, no product and none of the existing hair cleansing methods can guarantee you 100% of passing the hair drug test as each case is different. These hair cleansing methods have a 90% plus success rate if you follow the instructions precisely. You can read the comments and feedback from many heavy users on our site who achieved their goals by following the instructions and recommendations. Good luck with your test results and let me know you did. Here the situation, my friend is in his early 50’s and of slim build. He smoke 2 to 3 times a week from July to the end of August and the stopped completely. He used a vap and oil. In mid December he smoked 3 times, 2 hits each time and agin using a vap and oil. He then stopped completely. Recently he passed 2 or 3 urinalysis test. He also recently attempted the Majuico method using a variant of the products recommended. He has now purchased the items as listed via the website. What do you suggest? Also since he was such a little smoker, could he still pop positive after refraining for almost 2 months? Thanks for your help. Mark..Even though your friend did not smoke much, there is a chance that the THC-COOH levels will exceed the cutoff levels as he was vaping and using oils. So, it is a good idea to perform the Macujo method. As he has already passed the home urine drug test, he can perform the Macujo method any time before his hair drug test. I always recommend using an express home hair drug test after performing any hear cleansing processes. This will show him if he can pass his hair test or not. Just a few more questions; how long does it take to get the results back from the testing facility? How many times do I need to complete the Majcuo Method? Also how long does this method last and do I have repeat this if there is a time lapse between completing this and actual hair testing? Mark..Express hair drug test results are available within 2 business days of the sample being received by the laboratory. You can check all details in our express hair home drug test review here. If you have already passed the home urine drug test, you can perform the Macujo method any time before the hair drug test. As your body has already become clean from THC, your hair will not be re-contaminated again and should remain clean after completing the hair cleansing methods until you smoke again. According to the instructions, the Macujo method should be performed at least 5 times in 3 days as close as possible to your hair drug test. If your hair can handle it, more is better during these 3 days. So here is my situation, I have a hair test for my new job on this Friday in the morning. I have been clean since January 1, 2017. Before that I would consider myself a light smoker, tolerance wasn’t that high to get high so I didn’t need a lot of quantity and only smoked probably 4 times a week. I have known about the hair test after I got an interview and the job offer with a high paying job. I immediately ordered from test clear the aloe and ultra clean and have been following that method. I have pretty short hair and it grows pretty quickly, have gotten about 3 haircuts since I’ve been clean and I think my hair is currently an inch and a half long. I have been using the aloe shampoo now for 14 days and my test is on Friday morning, in which Friday morning I plan to use my Ultra Clean shampoo before the test. I am worried that if they think my hair is too short on my head, they are going to get it from another place, either my leg hairs or arm hairs because they are pretty long and I have a lot of it. Ive applied several treatments of aloe shampoo to my legs and arms but not as much as my hair, and I have used it on my arm pit hair every time I wash my hair because I heard they can get it from there too. Any info on anything else I should do to prepare would be greatly appreciated, I have been a nervous wreck about this. I have about half of bottle left of my aloe shampoo. Thanks a lot. Chris..I would not classify you as light user as you smoked several times a week even in small amounts. Usually companies ask labs to check your last 3 months history. 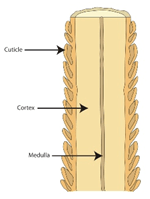 Since hair grows about half an inch a month, labs tests the first 1.5 inches of the hair closest to the scalp. However, even though you cut your hair three times already, your new grown hair might still be re-contaminated because of your THC body exposure. As result, after abstaining for a month, you still have 1.5 inches of contaminated hair. So far, we have seen that the best results users have is by combining the two methods: The Macujo and Aloe Toxin Rid Treatment methods. They start cleansing their hair with aloe shampoo for some time and then use the Macujo method 3 days prior to their hair drug test with the Ultra Clean shampoo used on the day of the test. According to the instructions, it should be performed at least 5 times in 3 days as close as possible to your hair drug test. As you have only 1 day left until your hair drug test, I would recommend trying to perform as many Macujo methods as your hair and scalp can handle. If you need to stretch the aloe shampoo, you should apply enough shampoo and just let it sit. I would not recommend any more haircuts though as it is easier to cleanse your head hair than your body hair. You might consider trimming/shaving your body hair to ensure a better chance that a head hair sample will be used. Good luck with your test this Friday and let me know how it went. I just found out that my drug screen is a hair folic in stead of a urine test. it will be almost 50 days since i smoked and I tested negative for a home urine test. I just ordered the aloe shampoo and the ultra clean shampoo kit. By the time I receive the products I will have around 3 to 4 days before my test. If I use the aloe shampoo 3 or 4 times a day before my test and then use the ultra clean kit the day of my test will I have a decent chance of passing.. I have short hair also.. Bryan..Unfortunately 50 days of abstaining is not enough time to grow 1.5 inches of new clean hair. As you do not have much time until your hair drug test, as soon as you receive Aloe and Ultra Clean shampoos I would recommend using aloe shampoo several times a day and also performing the Macujo hair cleansing method. The Ultra Clean shampoo should be used on the day of the hair drug test. I always recommend using an express home hair drug test after performing any hear cleansing processes. This will tell you if you can pass your hair test or not. You are on the right track and it looks like you have read the instructions and understand what you need to do. So the rest is up to you..
Best of luck and let me know how it went. Bobby..As you do not have much time until your hair drug test, I would recommend performing the Macujo hair cleansing method as soon as you get the Aloe shampoo. The Ultra Clean shampoo should be used on the day of the hair drug test. However, I am afraid even though you have not smoked much in 3 months, you need to perform at least 5 Macujo methods in one day since that is all the time you have. If you can handle more treatments, it can increase your odds of passing. It is possible, but it might be pretty tough on your hair. And none of the products or methods can guarantee you 100 % of passing the hair drug tests. Most proven hair cleansing methods have a 90% success rate if they are performed following all instructions and recommendations to the letter. I have just become aware of a hair drug test. I have been smoking for a year or so now with breaks in between. I have about 2-2.5 weeks until the test. My hair is about 3.5 inches. If I order today and begin immediately should the aloe shampoo (until the test) and 2 ultra clean applications before the test be sufficient or should i do more stuff as well. Any help would be awesome thanks! Nick..So far, we have seen that the best results heavy users have are by combining the two methods: The Macujo and Aloe Toxin Rid Treatment methods. They start cleansing their hair with old style aloe shampoo for some time and then use the Macujo method 3 days prior to their hair drug test with the Ultra Clean shampoo used on the day of the test. We always advise heavy users to complete the Macujo method as close as possible to their actual hair drug test in order to avoid recontamination by THC-COOH. According to the instructions, it should be performed at least 5 times in 3 days as close as possible to the hair drug test. I would follow the above mentioned recommendations if you would like to increase your odds of passing the hair drug test and if you hair and scalp can handle it more treatments are better. I always recommend using an express home hair drug test after performing any hair cleansing methods. This will tell you if you can pass your hair test or not. Should I try the home hair drug test before doing the ultra clean? Or do an application of the ultra clean and then take the test? Nick..I would recommend checking your hair sample with a home hair drug test before using the Ultra Clean shampoo. I have only used one line of cocaine in the last month, should I still use the detox to pass a hair test? Also, Is it ok to use conditioner after each application if he detox or should the detox be the only product I am putting on my hair until after the test? Christina..If you used cocaine only once during last 3 months, there is a good chance that the drug levels in your hair sample might be below the cutoff level. If you have enough time until your hair drug test, I would recommend checking your hair sample with a home hair drug testin a week and go from there. If you used cocaine at least several times during last 3 months and you test positive for it on a home hair drug test, you should cleanse your hair with a combination of the two methods: The Macujo and Aloe Toxin Rid Treatment methods. You should clean your hair with aloe shampoo for some time and then use the Macujo method 3 days prior to your hair drug test with the Ultra Clean shampoo used on the day of the test. You can use a hair conditioner. But you have to make sure that you wait at least an hour after the Aloe Toxin Rid Treatment application so as not to alter the effects. Does the treatment work for facial hair too??? James..Aloe Toxin Rid Treatment method works the same on all body hair. I do not have enough head hair, what is the next place quest diagnostics (most likely) or any other facility will take the hair from? Will the detox work also on the under pit, body and facial hair as long as it is used them same way you would your hair?? Michael..Aloe Toxin Rid treatment method works the same way on all body hair. A hair sample can be taken from any part of your body. However, for example if you would have shaved your whole body hair and left only facial hair, the facial hair sample would be taken. So, if you decide on choosing this approach, you will need to concentrate on cleansing only your facial hair with one or a combination of the proven hair cleansing methods. I would highly recommend cleansing your head hair as well even there is not much hair there as Labs prefer taking head hair unless you are completely bold or shaved. 15 days ago and before that was like a month prior what would u recommend I do?? Pat..If you smoked only 2 times during last 3-4 months, THC-COOH levels in your hair might not exceed the cutoff levels. In this case, you should have a good chance passing the hair drug test without cleansing your hair. However, this is no guarantee though. If you would like to see where you stand now, I would recommend checking your hair sample with an express home hair drug test. If you pass the home hair drug test, you shouldn’t have problems with passing the actual hair drug test. As far as we can tell Testclear is the only seller of the correct aloe shampoo and we have seen this through the many success stories of previous users which you can read in our comments section. Hope this clarifies your questions. Keep me updated and let me know if you need more help. I haven’t smoked in about a month. I did cocaine about 3 weeks ago I’ve used the macujo method and detox about 6-8 times in last 3 weeks will I still pass my hair folicle test.And also once used on the methods is my hair clean for good as long as I don’t use drugs anymore? 1. It is tough to say for me where you stand now after completing the hair cleansing method without knowing more details: your Bio and smoking history during last 3-4 months. If you were a heavy user, your chances of passing the hair drug test will be much higher if you perform the Macujo method at least 5 times in 3 days closest to your actual hair drug test. We usually recommend this approach for heavy users in order to avoid hair recontamination even if they have stopped smoking for a while as a significant amount of THC metabolites are still stored in their body fat cells. 2. In general, as soon as the drug metabolites levels in your hair drop below the cutoff levels, your hair should be clean for good until you start consuming drugs again. However, this works only for a user whose body has already become clean from THC or other drug metabolites and he can pass his home urine drug test. If you need more help, come back to me with more details or you just can use an express home hair drug test. This will show where you stand now with drug metabolites in your hair sample. I’ve stopped smoking. I was a heavy smoker and slowed way down to once a day in evenings to now nothing. Only been.a short time. My question is how long is the aloe toxin rid treatment and ultra clean process good for? I don’t know when my test will be it could very well be 2 months from now, most likely a month. I don’t believe my hair would be clean by then. Should I wait until I believe my test time is closer? Or should I start doing it now and just use up the expensive aloe shampoo and then use the ultra clean after I’ve run out of aloe shampoo? Moe..When your body becomes clean from THC (you test negative on a urine drug test), you can perform Old Style Aloe Toxin Rid Treatment plus Macujo methods at any time as you won’t face any problems with hair recontamination. As soon as the THC-COOH levels in your hair drop below cutoff levels as a result of performing multiple hair cleansing methods, your hair will stay clean permanently until you start smoking again. As you are a heavy user, it might take from 30 up to 90 days to pass a urine home drug test. During this time, you face the hair recontamination issue. So, if your hair drug test is in a month, you might wait until you know the drug test date and then start washing your hair with aloe toxin rid shampoo for some time and the Macujo method should be performed as close as possible to your actual hair drug test. The Ultra Clean shampoo should be used on the day of the drug test. According to the instructions, the Macujo method should be performed at least 5 times in 3 days as close as possible to the hair drug test. If your hair and scalp can handle it more treatments are better (8-10). If you have enough time until the hair drug test, I always highly recommend using an express home hair drug test. This will tell you if you can pass your hair test or not. Hope this clarifies your questions. And if you need more help let me know. I’ve smoked about once/twice a week for about three months. I’ve stopped and will likely have A couple weeks to a month before my follicle test. I’ve ordered the detox and ultra clean. Do I need to use the macujo method or will the detox and ultra clean be sufficient? Chuck..In your case I would recommend performing a combination of the Macujo and Aloe Toxin Rid Treatment methods. Users that have had the most success combine these two methods. Make sure you follow all instructions. Richard..I would recommend cleansing your hair with a combination of the Macujo and detoxTreatment methods and with Ultra Clean shampoo used on the day of the test. If you didn’t smoke much during the last 3 months, you can perform a combination of the above mentioned hair cleansing methods any time. As you do have enough time until the hair drug test, I would recommend performing a home hair drug test. This will show if you will pass the hair drug test or not. Prior to last weekend I didn’t smoke at all for 3 months. Before that I was an extreme smoker. Last weekend smoked all 3 days. My hair is thin but extremely long. Ordered the detox & zydot Desperate please advise! Mrs Gip..Even though you have not smoked for 3 months, because of your previous extreme toxic THC exposure, most of your 1.5 inches of your hair closest to the scalp are contaminated at the moment. In order to increase your odds of passing a hair drug test you should consider performing a combination of hair cleansing methods. So far we have seen that heavy users have the best outcome with their hair drug tests when they combine the two proven hair cleansing methods: the Macujo and Old Style Aloe Toxin Rid Treatment methods. They start cleansing their hair with aloe shampoo for some time and then use the Macujo method 3 days prior to their hair drug test with the Ultra Clean shampoo used on the day of the test. If your hair and scalp can handle it more Macujo treatments are better (8-10). If you have enough time until your hair drug test, I always highly recommend using an express home hair drug test. This will tell you if you can pass your hair test or not. Keep me updated. Let me know if you need more help. I have been sober for 2 1/2 years except around April 10 of this year I took two hits of marijuana. I have a hair follicle test coming up in a few weeks. Is it necessary that I use the shampoo? Dennis..I think your chances of passing a hair drug test are good. To be on the safe side and as you have enough time until your test, I would recommend using an express home hair drug test. This will show if you can pass the actual hair drug test or not. Just wanted to share my experience because prior to my hair test I was reading thru everyone’s comments worried out my mind. To spare the suspense, I PASSED! Little background, I am a daily smoker. I’ve been a daily smoker for, say about a year. I smoke multiple blunts a day occasionally smoke out of glass and rarely smoke wax. I was on vacation for most of May so I didn’t smoke most of that month. My drug test was in June and 3 weekends before I smoked a couple blunts and a wax pen and 2 weekends before I smoked a couple bowls and another wax pen. I had 8 days using the shampoo, I used it every day at least 2-4 times a day. In the beginning I was scared I would run out because it doesn’t look like you get much, so I barely used it. Towards the end I realized I still had a ton left and lathered it in there, waiting 10 mins each time. I made sure to get to the roots too. But then day of I only used the ultra clean shampoo exactly how it says to use it. I had a timer on my phone and it took about an hour in the shower but I passed!! I was extremely nervous, read a lot of successful and unsuccessful stories, but again, I’m a heavy smoker! >3 blunts a day for a year and still passed. There is hope! It is worth the money!! Good luck! Success..Congratulations with your test results and thank you for your detailed feedback. This will definitely help other users to achieve their goals of passing the hair drug test. How long after a person quits is it best to start detoxing? Would ten days be to soon to try to start after smoking weed? It’s wasn’t very strong but I smoked regularly. I got the shampoo but I worry about it not being enough time since I quit to get a negative result and wasting the shampoo. Should I wash my hair for longer then the ten days? Greenqueen..As you smoked regularly, all 1.5 inches of your hair closest to the scalp are contaminated at the moment. In cases like yours we usually recommend combining the two proven hair cleansing methods: the Macujo and Old Style Aloe Toxin Rid Treatment methods. Regular users should start cleansing their hair with aloe toxin rid shampoo for some time and then use the Macujo method 3 days prior to their hair drug test with the Ultra Clean shampoo used on the day of the test. We always advise regular users to complete the Macujo method as close as possible to their actual hair drug test in order to avoid recontamination by THC-COOH. According to the instructions, the Macujo method should be performed at least 5 times in 3 days as close as possible to the hair drug test. If your hair and scalp can handle it more treatments are better (8-10). Does this method permanently clean your hair or does it just cover up the thc. I have a test in about 6 months i am a heavy smoker ( usually everyday). So if i were to clean it a month in advance and stop smoking marijuana would it still be clean in a month? Joe..If you cleanse your hair in advance, it can be re-contaminated even if you abstain from smoking marijuana as your body fat cells still contain THC metabolites. This is why for heavy users we usually recommend performing a combination of the Old Style Aloe Toxin Rid Treatment and Macujo methods. You should start cleansing your hair with aloe shampoo for some time and then use the Macujo method 3 days prior to your hair drug test with the Ultra Clean shampoo used on the day of the test. Please remember that you should complete the Macujo method as close as possible to your actual hair drug test in order to avoid recontamination. According to the instructions, it should be performed at least 5 times in 3 days as close as possible to the hair drug test. If your hair can handle it (8-10) more is better during these 3 days. 1. With the information stated above, how will the hair sample be conducted from my person? Do I let what little hair grows on my head, grow out on my head for the sample, in this short period of time? 2. With that being said, would you recommend using the the Macujo method on a bald scalp or other parts of my body with hair? 1. I would recommend shaving all of your head and body hair including pubic hair properly except the places like your facial hair or under arms where you can grow your hair as long as possible during the next 7-10 days. You should perform the combination of Aloe Toxin Rid Treatment and Macujo methods on these unshaved parts of your face and body following all instructions to the letter. Even though your hair won’t grow long enough, we have seen that some Labs had to take hair samples with the length less than 1.5 inches as there were no other choices. Some Labs might reschedule the hair drug test in order to let the hair grow longer. In some cases, the hair drug test can be replaced with a urine drug test. 2. You don’t need to perform the Macujo method on your bald scalp or other parts of your body with no hair as it won’t be possible to collect a hair sample from these areas. I have a large amount of Detox (43oz container) to use on the areas I intend on treating. Since you recommend combinging that with the macujo method, I’m a little reluctant to use on face with the possibility of facial burns. I am thinking of using my leg hair since it’s the longerst hair on my body right now (<.5"). Is the the detox and ultra clean method enough with more that 7 days till testing? Eddy..Even though the Macujo method has some side effects, we have seen that the best outcome users get is to combining the two methods: Macujo and Aloe Toxin Rid Treatment with Ultra Clean shampoo on a drug test day. If you decide using only the Aloe Toxin Rid Treatment method, make sure you wash your hair several times a day. According to the instructions you should apply enough shampoo and just let it sit for a while. I would say that only a home hair drug test will show how effective Aloe Toxin Rid Treatment method will be in your case. If you have enough time until your test, I would recommend using a home hair drug test. This will show if you can pass it or not. HElp!!!!!! I started the 2nd step three days ago but last night I smoked half a gram. my drug test is the 23rd. if I keep on with the process do you think I can still pass the drug test ? David..7 days should be enough to cleanse your hair properly if you stop using marijuana until your hair drug test. As I recommended in my previous replies, you should keep washing your hair with the aloe toxin rid shampoo as many times as possible before you start performing the Macujo method 3 days prior your hair drug test and don’t forget using Ultra Clean shampoo on your hair drug test day. According to the instructions, the Macujo method should be performed at least 5 times in 3 days as close as possible to the hair drug test. If your hair can handle it more treatments are better (8-10). Hope this helps David. But if you cannot abstain from use there will be nothing that any method will be able to overcome. You have to want it and be willing to work for the results you are looking for. I am here to help but so much of this is up to you. I need Help!!! I found out my drug test is coming up on March 23rd and of course its a hair test, im freaking out. I smoked a little bit last night, had been clean for about three weeks before that, and before that smoked about 3 times a week for maybe a month a half. I know i have a decent amount of time (about 35 days) until the text, so i need to know what to do! I bought some of the materials for the Macujo method, but i could really use some adice here. Ross..It looks like you will have the time and the attitude to get this done and pass. 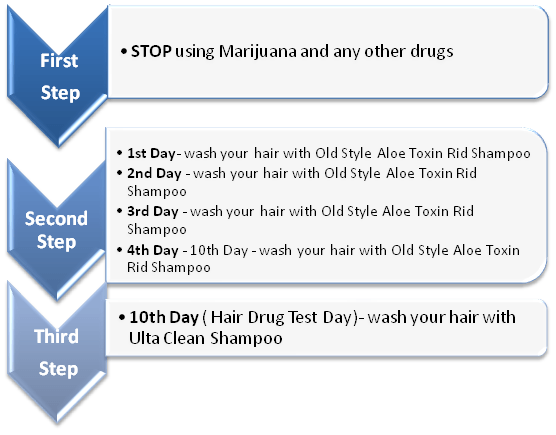 So far, the best outcome with hair drug tests users have achieved are when they combine the two proven hair cleansing methods: the Macujo and Aloe Toxin Rid Treatment methods with the Ultra Clean shampoo used on the day of the drug test. They start cleansing their hair with Aloe Toxin Rid shampoo for some time and then use the Macujo method 3 days prior to their hair drug test with the Ultra Clean shampoo used on the day of the test. We always advise moderate/heavy users to complete the Macujo method as close as possible to their actual hair drug test day in order to avoid recontamination by THC-COOH. According to the instructions, the Macujo method should be performed at least 5 times in 3 days as close as possible to the hair drug test. If your hair and scalp can handle it more treatments are better (8-10). If you have enough time until the hair drug test, I highly recommend using an express home hair drug test. This will tell you if you can pass your hair test or not.